eReaders are the latest trend for book buyers. One can’t walk into a bookstore (or visit an online version thereof) without being bombarded with advertisements for them. Why not use your Apple device as one? Thanks to Inkstone Software–the same people who brought you QuickReader–you can now have potentially a million books stored in your iPhone, iPod Touch, or iPad (the last one personally preferred)…for FREE, using MegaReader. Actually, to qualify that last statement, the book downloads are free, but the app itself is currently $1.99. Ladies and gentlemen, that’s what I call a deal. Paying $10+ for a print copy can be painful, I know. MegaReader already comes with 22 books, but you can search through six online catalogs (including Project Gutenberg) for access to over 1.8 million free ebooks; adding a new catalog is as easy as typing the URL in (under Import). You can browse by genre, recent popular downloads, author, or title. Once you download a book, it’s yours to read. For free (no, I can’t stop saying that). The books will show up on your home page, which you can order by Title, Author, or Recent. Once you’re ready to start reading, you can tap the gear button on the top right to personalize the look of your book (and make it as easy on your eyes as possible). There are 19 preloaded color schemes, or you can create your own from 23 fonts, hundreds of font sizes, and adjustable margin width and line spacing. Tapping on the book you want to read will take you to the table of contents, where a really nice feature called Last Place exists, which will take you to where you last left of in a book. You can read in landscape or portrait orientations, and tapping the center of the page will bring up the menus; swipe left or right to turn the page. 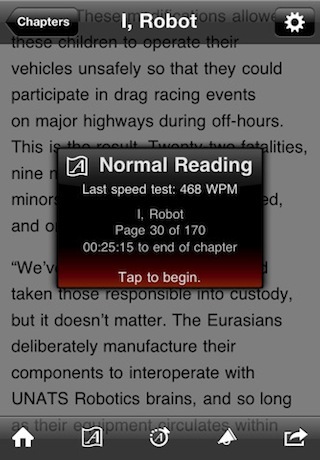 You can even take the Speed Test to see how long you have before finishing the book (users of QuickReader will be familiar with this function). Not only does MegaReader bring you the biggest free library to your device, it also does a fantastic job of looking pretty while you read. The layout is simple but well put together, and I love all the options for customization. I’d love MegaReader further if it allowed me to group my books into separate “libraries” or folders, though; having all the books in one list makes it look a bit too cluttered for my taste. I’d also love to be able to import my own files in here to read, since the interface is awesome, but I know this is just an app and not a replacement for an actual eReader. Mores the pity, that. For style and price, you can’t get any better than MegaReader. 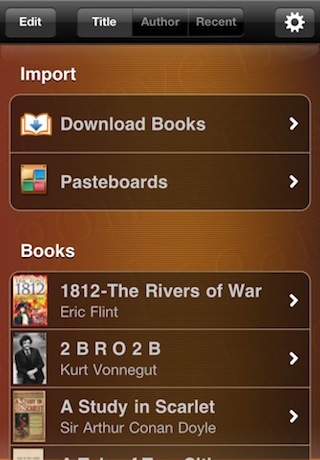 AppSafari review of MegaReader was written by Julie Guan on October 28th, 2010 and categorized under App Store, Books, Reading. Page viewed 6411 times, 3 so far today. Need help on using these apps? Please read the Help Page.